No other political leader in India in the past has been systematically and viciously maligned as Gujarat Chief Minister, Narendra Modi. His opponents and the media used to abuse him for every small matter. Even if a street dog died anywhere in Gujarat, the intellectuals used to debate in the screaming national media. It became the fashion of the day to abuse Narendra Modi and get national publicity. This brought Narendra Modi to the centre stage of the nation. In spite of all the malignment, he has emerged as a strong leader in Gujarat and the Gujarat people have reposed full confidence on him again. His detractors try to find one reason or other not to accept the verdict of the people. Even Congress is yet to congratulate him for the victory. Instead, they claimed victory for themselves, for reducing 2 seats over those of the 2007 elections. What made Gujaratis repose confidence on him again? The Gujarat people have been experiencing communal riots almost since 1714. Even in the post independence era, thousands of people belonging to different communities were killed in communal clashes. According to Justice Reddy Commission and Justice Davy Commission which examined the communal riots in Gujarat, recorded 2938 instances of communal riots in the 1960s. Though the official death toll in the 1969 riots was reported at 5000, the actual death toll was more than 15,000. 1980s and 1990s also saw a lot of communal clashes resulting in loss of huge human lives and properties. Many parts of Gujarat was under curfew for many days. Narendra Modi became the Chief Minister in 2001. The 2002 Godhra incident resulted in the loss of around 1100 lives of both the communities. 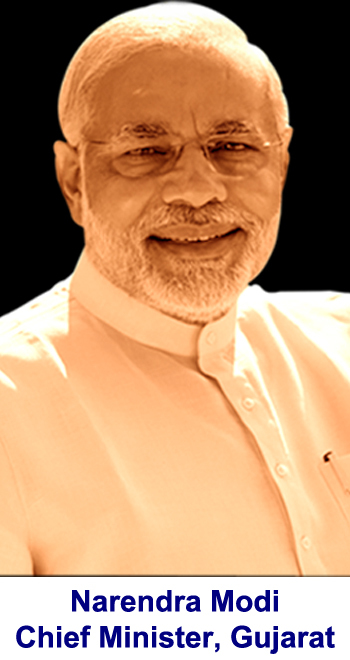 Due to various criticisms, Narendra Modi dissolved the assembly and faced the elections. In 2002, he secured 127 seats out of 182 seats in the Assembly. In 2007 elections, he secured 117 seats. In the recent 2012 elections, he secured 115 seats. After 2002, not a single incidence of communal clashes has been reported in Gujarat till date. Not a single day was under curfew. Although he is considered a tough administrator, he focused on the development of the State, and this resulted in all the communities’ getting economic benefit. In the 2012 elections, it is reported that around 25% of the Muslims voted for him. 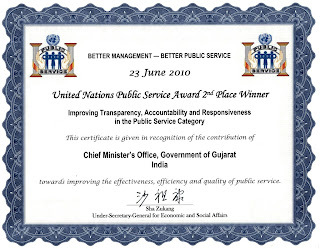 Singapore and Japan for the development of Gujarat. A few months ago, after realising the growth of Gujarat and the able governance by Narendra Modi, UK and US have started giving signal for friendship. 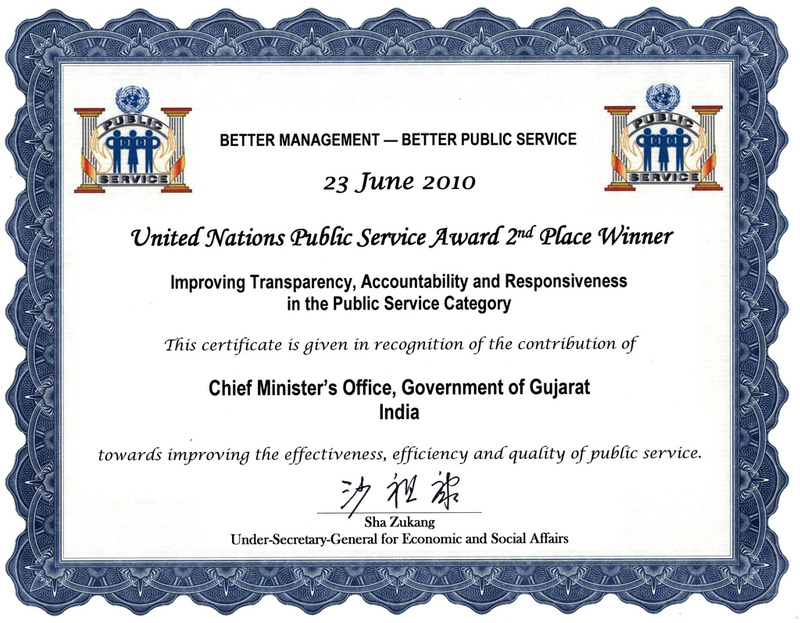 Even UN has recognised Gujarat for its transparent governance. force. Gujarat is also a power surplus state, providing electricity even to the villages. The state has registered more than 12% agriculture growth in the last five years against the national average of 2%. The per capita income at constant prices has shown robust growth in the past five years. There is also a major thrust on infrastructure. The development of ports and port-based investment activity is an instance. There is also a plan for shipbuilding parks along the coastline. Due to the stability of the Government and a riot-free Gujarat, investors have started preferring to invest in the State. 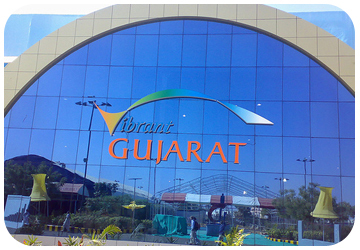 Vibrant Gujarat Global Investors' Summits (VGGIS) of 2007, 2009 and 2011 have attracted investors to sign MoUs for investments exceeding Rs.35 lakh crores. In the words of Narendra Modi "We are marching ahead with the mantra of Vikas, Vishwaas & Vijay...Our vision has been, is and will remain all-round growth to create a Bhavya & Divya Gujarat " Braving all the challenges and abuses against him, Narendra Modi has victoriously emerged as the leader of Gujarat. In a democracy, everyone should respect the verdict of the people. We have to wait and see whether he will move towards New Delhi too with the same mantra. Please also watch the video on the performance of Gujarat in the last 10 years. give the dog a bad name and then............. hang it.